I flew Cathay Pacific from Zurich to Hong Kong. The meals and snacks were good. The entertainment screen was larger than normal and the entertainment selection was very good. I would definitely fly them again. 22% of Cathay Pacific passengers were over 60. The most popular flight route for Cathay Pacific was - Hong Kong to Manila. The top travel destinations for Cathay Pacific passengers were Hong Kong, Manila, San Francisco. 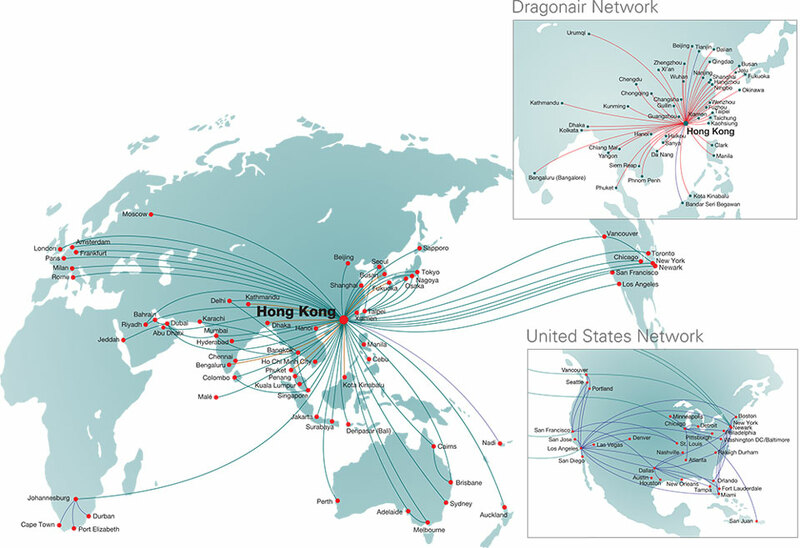 The most popular airport for Cathay Pacific was Hong Kong International Airport. Known for its main hub at Hong Kong International Airport, Cathay Pacific is the international flag carrier of Hong Kong. It was founded in the year 1946 and it offers passenger and cargo services to 168 destinations in 42 countries. Cathay Pacific has been headquartered at One Pacific Place, it is very well-known for offering top-notch amenities and services. In the year 2012, Cathay Pacific won the world's Best Business Class at 2012 World Airline Awards. Cathay Pacific has the impressive fleet size of 133 aircrafts that flies to destinations comprises of Amsterdam, Abu Dhabi, Atlanta, Chengdu, Chongqing, Dallas, Denpasar, Dhaka, Mauritius, Miami, Moscow, New York City, Sydney, Vancouver, Shanghai, Adelaide, Anchorage, Auckland, Chennai, Colombo, Delhi, Dhahran, Manchester, Melbourne, Milan, Mumbai, Rome, Tokyo, Toronto, Singapore and many others. The prominent aircrafts in the fleet of Cathay Pacific include Airbus A330-300, Airbus A350-900, Airbus A350-1000, Boeing 747-400, Airbus A350-1000, Boeing 777-200, Airbus A340-300, Boeing 777-300 and Boeing 777-300ER. Cathay Pacific is known for offering passengers various options for check-in facility. Online check-in, mobile check-in and airport kiosks are some of the great ways to check-in at the airport. Online check-in: Waiting in the long queues for check-in is now thing of the past. With Cathay Pacific now you can easily check-in 24-48 hours before the scheduled departure of flight. Mobile check-in: Mobile check-in facility gives you the big advantage of check-in anywhere at your own convenience. The main requirement for mobile check-in facility is a mobile with internet facility. This facility is only available for flights from 48 hours to 90 minutes before departure. Airport Kiosks: Airport kiosks at Cathay Pacific Airport are a great way for self check-in. At these airport kiosks you can even print your boarding pass. You can check –in at these kiosks within 48 hours of the scheduled departure your flight. Earn reward points with Asia Miles and the Marco Polo Club, the Cathay Pacific frequent flyer program. By earning miles or reward points you will get to bag free flight tickets, priority check-ins and much more. The Marco Polo Club is the most exclusive loyalty programme that offers a plethora of privileges for the frequent flyers. Since Cathay Pacific has the affiliation with the OneWorld and by joining hands with Dragonair, The Marco Polo Clubs is the most influential loyality programme in Asia. Dragonsair has the amazing coverage in Mainland China. This loyality programme covers around 850 destinations in 150 countries and offer you numerous privileges. By joining this programme you will be automatically enrolled with Asia Miles, it is Asia's leading travel reward programme. Green Tier: It is the basic class of The Marco polo Club. Some of the benefits of this class include flight reservations via dedicated 24-hour The Clun Service Line, extra legroom seat redemption, extra baggage redemption, lounge access redemption, personalized baggage name tags and much more. Silver Tier: You can upgrade to Silver Tier by flying 30,000 club miles or flying to 20 sectors. It boasts of numerous benefits from the likes of advance seat reservation, priority listing, extra legroom seats, easy check-in through business class counters, priority check-in, priority boarding and others. Gold Tier: The Gold Tier is easily upgradable with 60,000 club miles or flying with 40 club sectors. With Gold Tier you will avail benefits comprises of extra legroom seats, extra legroom seats redemption, check-in from the business class counters, extra baggage redemption and many more. Diamond Tier: For Diamond Tier you have to accumulate 120,000 club miles or have to fly through the 80 club sectors. The advantages of being the Diamond Tier member are advanced seat reservation, check-in through first-class counters, extra baggage redemptions, priority baggage handling, access to Cathay Pacific first class lounge, access to Cathay Pacific Business Class lounge, priority boarding, priority baggage handling and much more. Those who want to make some changes in their ticket they can easily do it with the online function of the Cathay Pacific. This is only applicable to the journeys that commences from Australia, Bangladesh, Canada, Denmark, Germany, India, Korea, Italy, Malaysia, Netherlands, Pakistan, Republic of Ireland, Saudi Arabia, Sri Lanka, the USA, United Kingdom, Thailand, Africa, Bahrain, Belgium, China, Denmark, China, France, Hong Kong, Indonesia, Luxembourg, Mexico, New Zealand, Republic of Ireland, Saudi Arabia, Singapore, Switzerland, U. A. Emirates, Taiwan and others. Don't forget that Online Booking Change function can only be proceeded once. Date and time changes for the flight booking can be easily made at cathaypacific.com via Manage Booking. •Children that are up to 2 years (24 months) are not required to have their own seat. •Take a note that only one lap child is allowed per adult. •Only domesticated birds, cats and dogs with their kennel are allowed on the aircraft. Cathay Pacific Hub - Airports used as transfer points to get passengers to their intended destination.